For this post, I have put together a collection of the best saw horses currently available. The following saw horses use the latest innovative components to meet your needs and help to ensure you do your best work. So here is my list of The 10 Best Saw Horses. The DEWALT DWX725 Heavy Duty Work Stand has a compact design that allows easy transport and storage. 1000-pound capacity (each) and handles the toughest jobs. Made from lightweight aluminum construction (15.4-pounds.) it allows for easy transport to and from the jobsite. Leg Lock Levers that allow for fast and easy set up. The Transport Latch allows a pair of stands to be easily transported together. 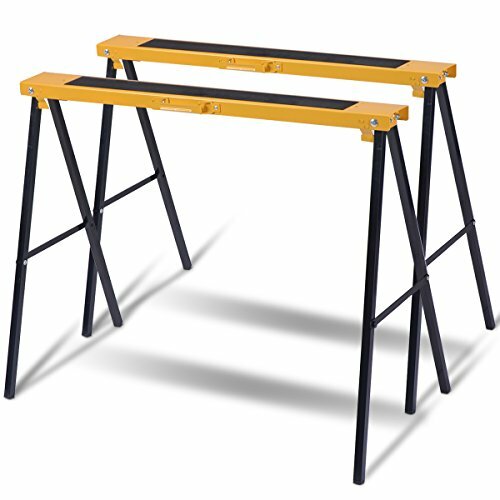 The ToughBuilt C500 Sawhorse and Jobsite Table is durable and rugged. Constructed of 100% high-grade steel. 1100 lb. capacity alone and 2200 lb. per pair. Features 2x4 support arms that transform two sawhorses into a solid jobsite table. Fast-open legs, setup is straightforward and simple. Powder-coated and zinc-plated steel prevents corrosion and withstands rigorous environments. 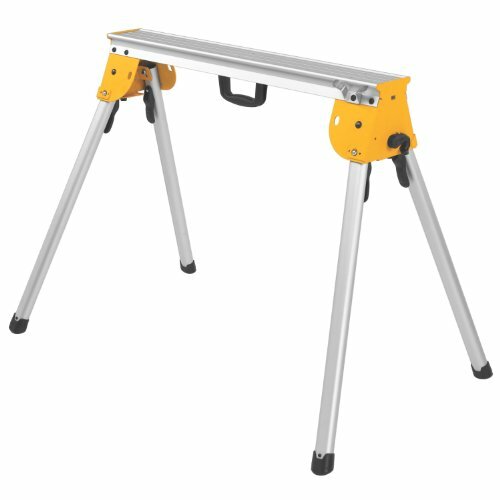 Folding sawhorse includes an easy carry handle for effortless transport and rolled edges for safety and comfort. 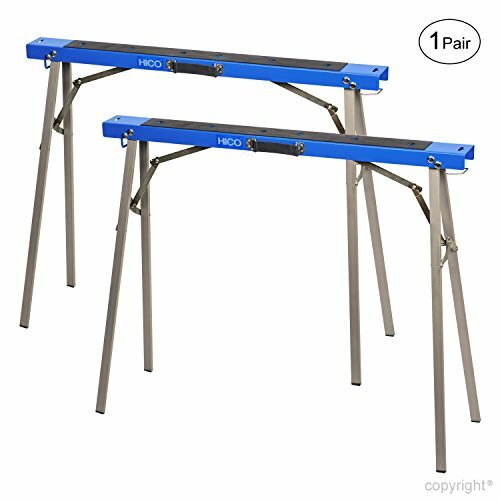 Pair of all steel, heavy duty folding sawhorses that will make all of your DIY or professional projects easy. A stable, solid work surface is paramount for good work, and these will provide you that, and when you’re finished, will fold right up for easy storage. 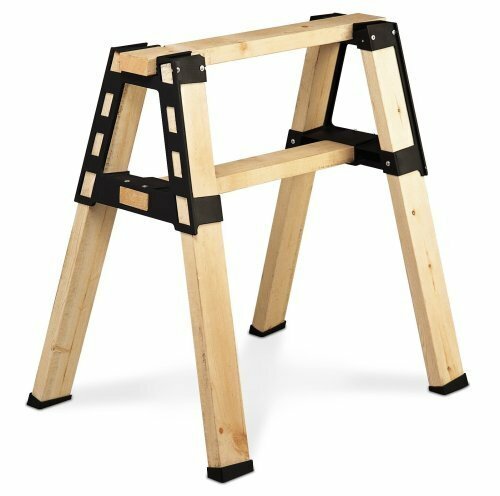 Fully assembled, you can use these sawhorses right out of the box – just unfold the legs, use the locking pin to lock them into place. One-inch heavy gauge tubular steel legs, and a powder coated, rust-resistant finish. And because this is a pair, you’re getting a 1,000lb weight capacity. You can also attach a 2x4 or 2x6 wood top to each one (they are pre-drilled to accept this). 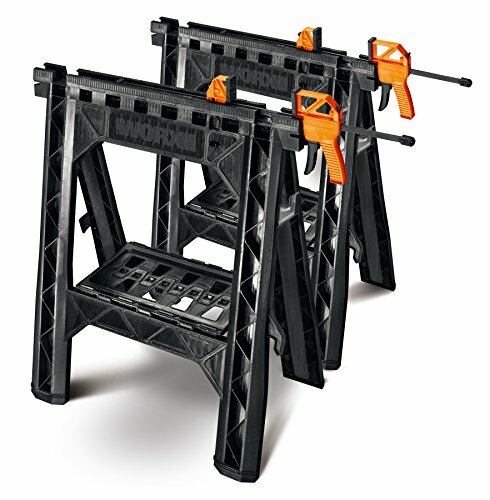 The WORX Clamping Sawhorses come with two detachable bar clamps that act like a second set of hands to safely and securely hold materials while you work. Clamps attach directly to the sawhorses without tools, hold objects up to 18 inches wide, and can be positioned vertically or horizontally so you can work from any angle. Easily detachable for use on other projects or if you simply need a standard sawhorse. 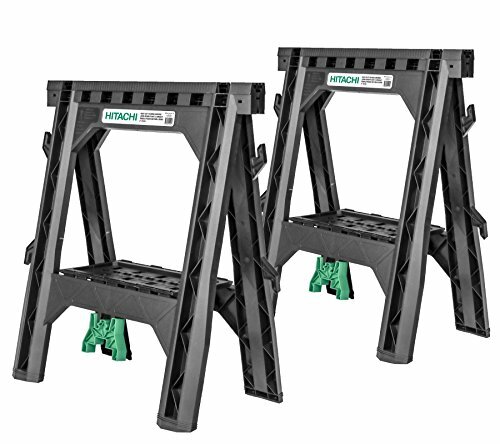 When used together, the sawhorses can support up to 1,000 pounds, allowing you can work with even the heaviest materials. Each features a 2-inch wide indentation on top to help hold and steady plywood, particleboard and other sheet goods. Built-in lower shelf and cord hooks help keep all your tools easily accessible, organized and out of the way. When you’re done working, the sawhorses fold flat for easy, space-saving storage. 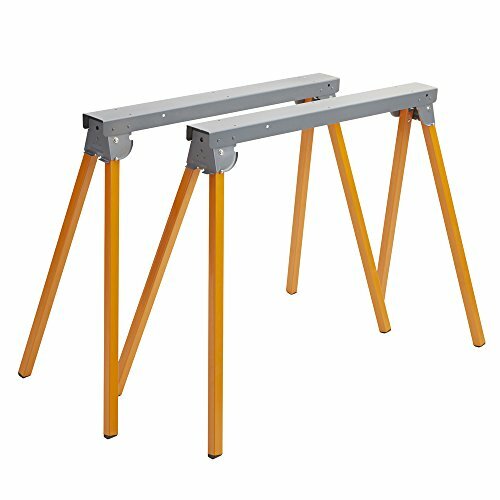 Allows for the legs to be adjusted separately, allowing the sawhorse to stand on uneven surfaces. Rubber inserts for added stability. Made from high-quality, sturdy polypropylene and steel for a sold sawhorse. Unique slide mechanism, providing for easy, smooth adjustment. Pro Brackets is perfect for DIY's or professionals. Easily create custom Sawhorses with this handy kit. Easy to customize, to the size you need: three, four or five feet. Just add 2 x 4 stock to make a pair of sawhorses in any length, width or height. Simple assembly with only a screwdriver and saw. 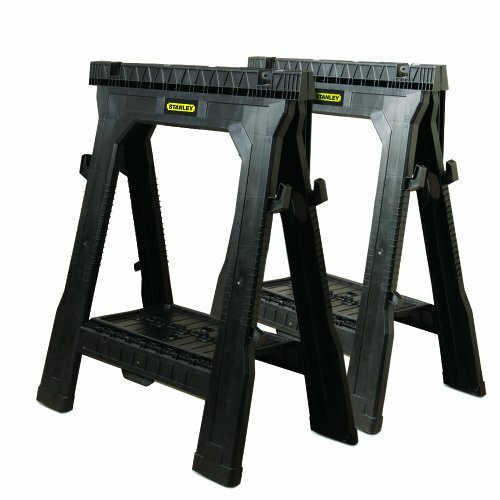 Kit includes a pair of ProBrackets Sawhorses, stabilizing feet and all hardware to hold up to 2,000 lbs. 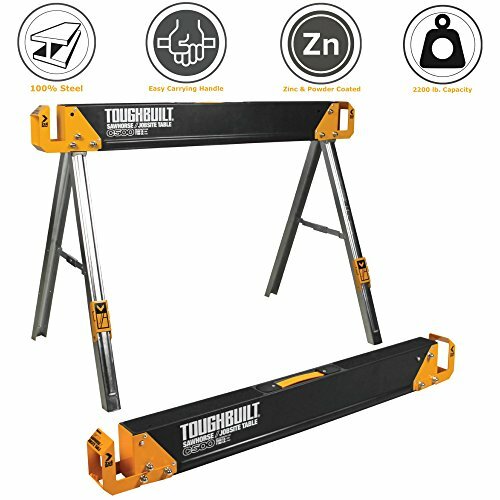 Lightweight and easy to move around the job site. The additional Hitachi Green sawbucks are designed to support the Flat side of a 2x4. Can be used to raise or extend the work surface area to support 4x8 sheets. A built in shelf and cord hooks on each provide additional storage for users. Simple, compact design is perfect for a home workshop or transporting to a job site. Anti-slip work surface keeps your work piece in place. 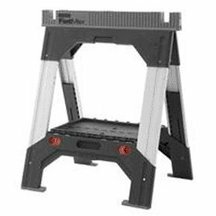 Legs fold into frame for storage or transport using convenient carrying handle. Cross brace on each side creates a sturdy foundation for supporting heavy loads. Ruler top with rubber points to help secure the surface in place while you work. Tray that conveniently holds your tools. Side hangers to hold cables. V-groove holds materials in place as you saw. Perfect for sawing lumber and pipes, construction, and remodeling applications. The set comes with two folding sawhorses. Up to 250 lbs weight capacity for each sawhorse. A grip handle for easy transport. Each sawhorse weighs 8.7 lbs. Sawhorses come fully assembled, no installation is required. I hope this list of the best saw horses was helpful.